Home › The Golf Swing – Form or Function? I believe the difficulty stems from the absolute plethora of golf tips, forums, books, and golf videos all telling you a different way to make the golf swing. How is it possible to sort out the good from the bad? And what do all of these tips and instruction videos address? Golf Swing Form is how you make the golf swing and it’s usually broken down into pieces, such as the takeaway, the backswing, the transition or the downswing. But that’s not where it stops. There is also, backswing plane, wrist hinge, follow through and more. Does it help? I know many golfers who will agree that this type of instruction only replaces one problem with another. But sometimes those tips are spot on, so I’m not here to bash any instructor who is giving you free golf swing tips. Let’s compare it to walking. Start by stepping off with either foot. You want to lift your knee 35 degrees and lean forward 17 degrees at the same time. As you lean forward, roll across the back foot and bend your knee 22 degrees. As soon as the stepping foot touches the ground on the heel, push off with the back foot and pick the foot up bringing the knee to 72 degrees until the foot passes the now planted front foot. Once the back foot passes the planted foot, allow the knee to extend to 30 degrees in preparation to land that foot. Get the picture? How long would it take you to learn to walk that way? Yet, that’s how golf is taught. The golf swing, taught as form is taught as something that happens around the outside of your body, but where does the golf swing come from? It starts internally in your brain and the message gets sent out to the muscles from the brain. Then the muscles act on the messages the brain is sending them. How does the brain know when you are doing the golf swing properly? If you try to use form instruction, the brain has no idea until the ball is hit, by seeing what happened and then it’s too late. Well, have you tried the walking drills on either Golf Swing Control or Bio-Visual Focus? Within minutes you are walking properly without any of the technical instruction like you see above. Your feet respond to gravity, as do the rest of the muscles in your body by trying to maintain balance. Using the system tied to that function, I simply made you aware of how the function works and showed you how to make adjustments to get a better result. Your brain uses the feedback from the “gravity nerve system” to know if you are walking correctly or not. Golfers always ask me for tips to help their golf swing, and they always look at me funny when I say I can’t give them any. The only tip I can give is to show a golfer how to get into balance. This was the problem I had when I collaborated the the folks who made the Ultimate Golf System. They wanted me to give golf tips on a regular basis to keep readers interested in their website. I couldn’t do it. I can only teach cause and effect and it all comes down to awareness of balance and timing. Done properly, balance awareness and timing fix everything. So, if you ask me why you make certain mistakes in your golf swing, I can help. I will explain why it happens and what part of your body function you need to address to correct it. You’re reading this because deep down, you know golf tips don’t work. You probably have tried lots of “form style” instruction to no avail and you just want to know why you don’t get it. Now you know why my teaching is so different. Go back and take a closer look if you have any of my other stuff and I think the light bulb will light. Learn the function and skip the tips. You’ll start enjoying golf, as you should. So take a look around at the instruction that is out there, when you see that they are telling you how to make a certain part of your swing conform to what they believe to be the perfect form, RUN, don’t walk to the nearest exit. If you see an instructor teach you a drill of some sort to help your golf swing and he doesn’t explain how the drill works or how you know it’s working, I would recommend keeping your distance. It could distract you from making a golf swing that fits your body. If you’re not sure whether instruction is form or function, drop me a line and ask. I’ll be happy to help. You can go to either http://www.golfswingcontrol.com or http://www.biovisualfocus.com and sign up for the free videos. The setup is lesson 3. I’ve scoured the internet for any/all information on integrated dynamic balance in the golf swing and came up with bupkis. The closest I got was Martin Chuck’s concept of “counterbalancing” both the backswing and downswing. Sounds like a different name for dynamic balancing, which sounds like your approach to a truly individualized swing, in balance for all 1.5-2.0 seconds of the golf swing. Also I don’t remember any mention of downloading a “swing drill” How/where do I obtain that? Really looking forward to the book!! 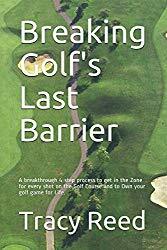 If you signed up on http://www.golfslastbarrier.com to receive updates on the upcoming book, you get a link to download the swing drill as a bonus. Your emphasis on function is easy to understand and it convinces me. However there are some structural elements in the swing path without which a successful swing will not be achieved repeatedly. I am unclear from this email how these elements are to be included without adding or altering the current swing path deliberately. Congratulations on this letter and I hope you will expand on this area. If during your backswing you move slow enough where you can monitor and adjust where you feel the weight felt under your feet, the whole body responds just as it did when walking. If you use the swing drill in combination with monitoring balance, you will develop the swing that matches your body. This is how I customize my better players golf swings to fit their body structure. This process hasn’t failed me yet.